Nairobi is a city without a hero, but not in Tuko Macho. In this vigilante story, our hero wears a hoodie. Tuko Macho, director Jim Chuchu’s latest work under The Nest Collective, is a web series set in Nairobi. Its storylines are drawn from real-life stories we have become uncomfortably familiar with. Biko, played by Tim King’oo, is a man on a simple mission with complex goals. He leads a group called Tuko Macho that is cleaning up the city by putting its untouchables on trial. First they kidnap the person and then present them to the city via a web link, with evidence of the person’s transgressions. The audience is then asked to vote on whether the person should die. 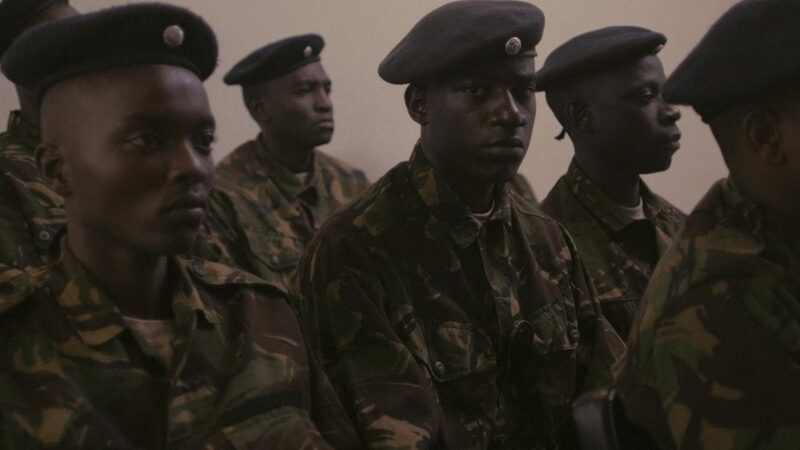 In this fictional Nairobi, justice is democratized. On the other side of this conflicted world is a good cop called Salat, played by Ibrahim Muchemi. He is a deep voiced, grim and proper cop, with an idealistic view of what the city can be. Over this story backbone are layers upon layers of themes. The primary one is vigilantism, and its utility in a city without a hero. Biko is the philosophical and operational heart of the operation. Mwarabu, played by Njambi Koikai, is his moral center. The role of keeping Biko within his ideals falls on her. She reminds him of his original plan to put only three people on trial. Since we are just halfway through the series, we can assume he moves this target. Although the character background so far has developed painfully slowly, Biko’s watershed moment seems to be the discovery of marked ballot papers. He quit his job in the army after that to do something about it and, this is extrapolation, nothing happens. Nothing happens because the idea of what is normal in Nairobi is a blueprint upon which everything else can be fit. Biko wants to blow the whistle in a country that doesn’t care much for whistleblowers. You can see the motivation for this character background for the writers. From David Munyakei to Kiriinya and Githongo, Kenya’s relationship with this type of vigilante has always been cold. There was hardly any outrage when Munyakei was arrested, and then died a broken man. Or when Kiriinya was shot in broad daylight in an upmarket side of town. To do something about it, Biko needs to use the shock-and-awe method. He needs to inspire Nairobians to demand better, and to demand justice. In Tuko Macho, the idea that Pastor Kangai (episode 2) can get away with running over someone is not far-fetched. It has happened in non-fictional Kenya more than once. What Biko and Tuko Macho do is to run over these ideals with an alternative form of retributive justice. They bypass the many layers that grow over the ideas of what is normal and acceptable. Every time this hooded hero and his team kidnaps someone, there is a national conversation. There are reports of mobs seeking instant retributive justice on the streets, and there is a philosophical divide, even within the justice system. There’s always the snobbish TV commentator who sees no problem with what Biko and his group are doing. To counter him or her is the moralist who argues for the rule of law, for the repair of institutions. In Tuko Macho, the hero-cop is Salat, a detective who believes the institution can be repaired. He also believes that what Biko (whose pseudonym in the story is Jonah) is wrong and unsustainable. “Jonah anafaa afungue branch yake ya karao, tuone kama anawezana na Wakenya.” Ibrahim Muchemi, who plays Salat in the series, says he wishes his character had some of Biko’s qualities. In the story, he is stuck between the confines of being a clean cop and actually cleaning up the city. Men and women like him end up stuck their entire careers, as their friends get promoted for their kills, and for all the money they bring in. For Salat to be anything like Biko, he would need to be willing to do anything to get justice. But he can’t because that’s not who he is. We are not familiar with this cop image in Nairobi. But even before we get used to this ideal cop in Salat, he texts up a girl who turns up being a prostitute. That particular scene is as confusing as it is humanizing. We have to set aside our instinct to be moral absolutists. Not just for Salat but even for Biko, and even the people he puts on trial. Biko’s goals for Nairobi haven’t been fleshed out completely yet, but what we see so far is a play on how we interact with justice. Salat’s partner tries to explain why the relationship between cops and citizens is broken. He says “I used to like this city a lot. And I wanted to be a cop. I wanted to take care of this city. But I hate being a cop.” Then he adds: “All these people walking in the street think they are good people because they go to church. But one lie, one mistake, and that’s it.” Perhaps, he adds, they don’t like us because we only see them at their worst. When they have broken the law or when someone else has. Salat says nothing. He already knows this, he already feels it too. But this relationship between cop and civilian is complex. The institutions that should be heroes serve just one or two classes of society, leaving the others derelict and abandoned. The true fault in the system has always been that the crimes of the poor are punished disproportionately. Unbridled violence has become one of the hallmarks of class conflict, as in a dystopia. This discussion comes up when Tuko Macho put Big Show on trial. Big Show is a murderous Nairobi County askari who rules the streets and molests anyone who crosses his path. In Kenya, vigilantism has been many things. It is the random mobs of strangers who are willing to participate in the killing of a suspected thief. The random mobs on Twitter who decide who has been sexually harassed and who hasn’t. 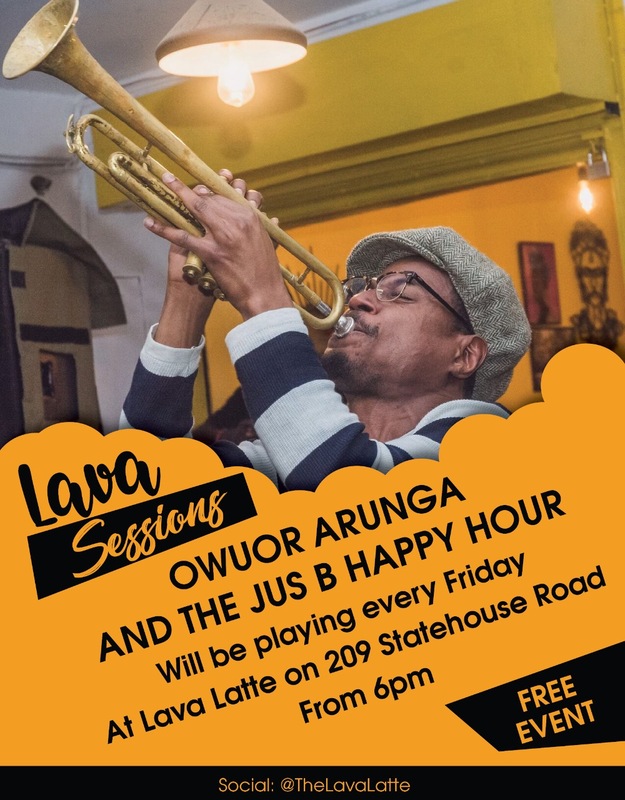 It has been Sungu Sungu, the Taliban, the Mungiki, Jeshi La Wazee, the Kaya Bombo Raiders. It was the group in Karatina who, on April 20, 2009, hacked 36 Mungiki members to death. It could even be Kwe Kwe and Rhino Squads, vigilante units working outside the law from within it. In many ways, some of these forms of vigilantism have been added to the identity of Nairobi. Lone ranger cops like Tyson Mkisii, Sniper, Lelei, Sang, Katitu, and PD Shaw are part of Nairobi’s history and future. They have been celebrated in articles and documentaries, and deemed the answer to a system that is broken beyond repair. Insiders who become as ruthless as the bandits and law breakers they hunt. But civilian vigilantes in small groups are rarer. Once in a while, a mob attacks a police station and frees someone, only to kill him right in front of the police. Three people in that mob will die; the system does not allow competition. The retributive justice Biko stands for works through the fear of punishment instead of respect for human life and laws. Every crime here is punishable by death. Its effects are immediate, traffic clears up the day they put Dan the matatu driver on trial. Carjackings most likely fall when Charlo dies, and County askaris most likely behave after Big Show is executed. As a short-term solution, it works. But the kind of carthasis Nairobi needs doesn’t need a punisher as much as it needs a re-statement of its identity. Biko is conflicted about this when the city votes to save Dan, the reckless matatu driver. “Sidhani watu wana understand. Hatuwezi punish zile crimes kubwa tusahau hizi ndogo.” But crime and punishment have always been defined by class conflict. Tuko Macho seems to be falling into the same trap that the justice system is in today as being ruthlessly efficient when punishing crimes by the lower classes. This could change as the story continues but so far, Biko’s choice of criminals would have been punished by the system anyway, in some way. Charlo the carjacker would have been shot, eventually. Big Show would have been discarded when the system didn’t need him anymore. Dan Otieno would have bribed, his way of paying the system to let him drive as he wills, until he causes a fatal accident. Salat’s girlfriend voices this fear about Tuko Macho‘s trajectory, saying that it is only a matter of time before they come for people like her. In the seven episodes so far, Pastor Kangai is the outlier. 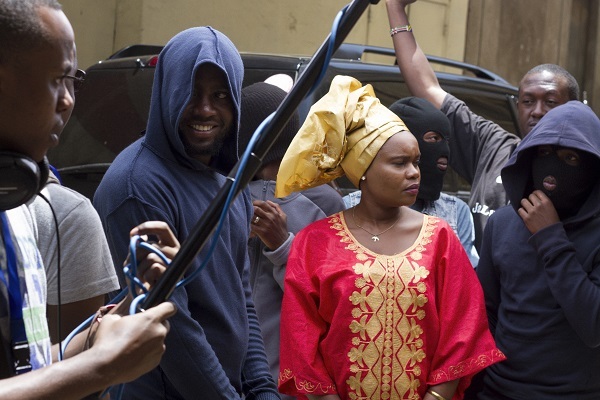 Shooting the Pastor Kangai kidnap scene. Perhaps this is the goal, to first drive fear in the big criminals before going after them. Tuko Macho has become an omnipotent force, instilling good behavior through the words “We can see you.” We can always see you. In the real world, there is a fear that by lionizing Biko, Tuko Macho’s creators are giving audiences a license to kill, and to exert justice on their own. Tuko Macho is a fictional story that traverses both worlds through the internet, and by allowing audiences in the real world to vote for or against the execution of characters in the show. 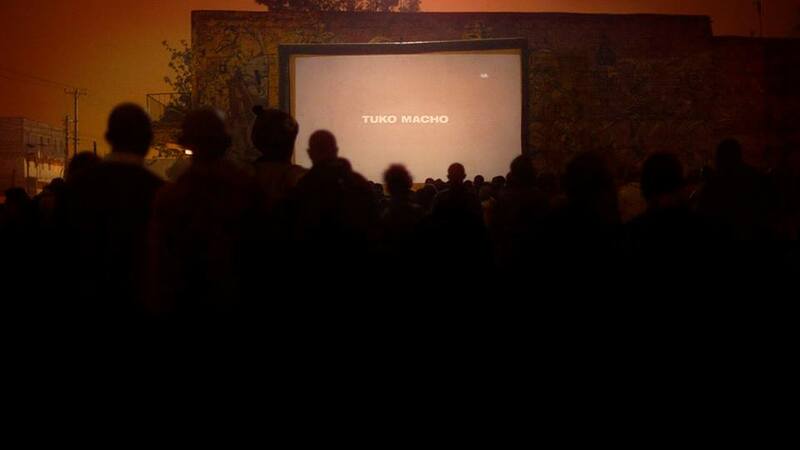 The question came up during the initial screening of Tuko Macho at The Junction, and many times since. It is a remake of a question The Nest Collective have faced before, with Stories of Our Lives. The five-part story of experiences of gay people in Kenya is banned in Kenya “because of moral reasons.” Basically the ridiculous idea that watching it would trigger a homosexuality epidemic in the country. 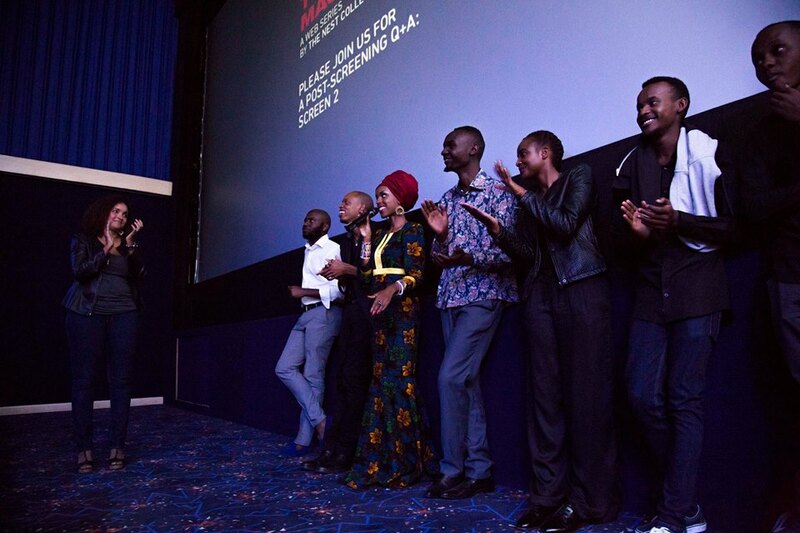 Part of the cast and crew at the screening of Tuko Macho. Although we see justice as moralistic, it is not. When a society names itself and normalizes things, it lists transgressions and retribution. In most human interactions, this retributive impulse prioritizes itself over other value systems that come into play during decision making. Once someone is wronged, it is hard to let it go unless the offender is punished. If?it were not a state and a divine responsibility, we rightly fear, we would be in endless cycle of retribution. It would be an eye for an eye for an eye for an eye until we all didn’t have eyes. We are already seeking retribution, even without Tuko Macho‘s prodding. Unbridled power is used to keep the socieconomic classes in check. One good example here is a daylong sweep through Kosovo, in Mathare, on June 7th 2007. In Boniface Mwangi’s images of that day, we see an entire population made to lie on the ground for hours, and to “produce” those who had killed two police officers three days earlier. One person dies after a police man accidentally dropped his gun. It is impossible to imagine that happening in places where upper socioeconomic classes live. In Mathare, Big Show is not a random County askari with unbridled powers, he is the man who steals from you, kills your neighbor, and lives next to you. But that doesn’t mean audiences in Mathare will watch?Tuko Macho?and go out and start vigilante groups. 2007/8 showed us as much; we are paining, we are angry, and the carthasis we need does not need a bridge. Nairobi’s equilibrium is an illusion because the class divisions that were ingrained in its blueprint are still there. The Tuko Macho logo, which they leave behind every time they dump a body of someone they’ve executed. Those divisions of Kenyanness, Jim Chuchu says, are what the webseries is tackling. The story “is showing how these different layers collide. I feel like our identity exists between these borders.” Nairobi has an identity in grayness, where everything exists at the junction of extremes. Corruption exists between legal and illegal. The immorality of theft of public funds is washed by spending it in the economy. We are ambivalent on many things, and so is our identity. There are multiple tools that Jim Chuchu and The Nest Collective use to drive these points home. Other than narrative tension, the primary one is language; most dialogue in the show is done in Sheng’. Sheng’ is a core part of Nairobi’s identity, born of the gray areas between several languages. The choice of an urban language targets several classes of people as much as they alienate others. Tuko Macho airs exclusively on Facebook. Although the filmmakers got it rated, they still managed to avoid the next layers of censorship and mediation by choosing an online platform. It is a social study into how audiences can interact with such material on a platform where they can give feedback directly. Even more so, where the filmmakers also invite them to vote on whether the characters on trial live or die. Sometimes the camera angle is diagonal, cutting out the faces and bodies of those talking and focusing on singular points such as walls. It is a cinematic tool called the Dutch angle; its role is to show psychological uneasiness and tension. This bugs many audiences, which is actually its purpose. But the key concern seems to be light; how dark the series is. Not thematically, but in the amount of light in the scenes. The darkness in the series is deliberate. Because filmmaking is a form of visual storytelling, light is perhaps the most important cinematography tool. It determines more about how you consume movies and series than you consciously know. Light in itself is a tool here; or rather the absence of it is. Beyond the thematic effects of low-key lighting to create that dark mood necessary to tell a story of human failure and hope like Tuko Macho,?there’s something else. “Light is a class thing,” Jim Chuchu says,” and most people don’t realize what they are voicing.” Even white walls, Jim Chuchu tells me, are a class indicator. When The Nest Collective played the same episodes in Mathare, no one commented on the lighting. The lower you go, the darker it becomes. Below a certain socioeconomic class, even white walls disappear. Salat has white walls at work and darkness at home. Tuko Macho’s hideout is so dark that it’s hard to see how the characters actually look. Ownership of light is a class thing; so is justice. All images courtesy of The Nest Collective.